Drake offers over 30 years of experience designing and building process chillers for your industrial applications. Our industrial grade process chillers come as a complete packaged unit so they can be simply dropped in place and turned on. The internal tank helps maintain a cold water temperature to ±1°F to prevent spikes in temperatures no matter how many of your processes are operating. Drake has experience in designing process chiller systems whether you are cooling bio-fuels or multiple pieces of equipment. Here at Drake we understand that you rely on us to keep your industrial processes chilled so we build reliable solutions for each and every cooling application. Drake chillers take the heat so you don't have to. 1) Equipment Chiller: Through our experience working with industrial processes we understand the importance of tight temperature control. Drake provides cost effective solutions through the use of variable frequency drives (VFDs) and recirculation tanks. All of our equipment chiller systems are expandable for future growth and can support 1-100+ pieces of equipment. 2) Process Chiller: Drake offers a variety of redundancy options to ensure that your processes are always chilled when you need it. From multiple refrigeration circuits with standard lead-lag control to auto-changeover pumps, our units are designed to ensure that your process is continuously running. 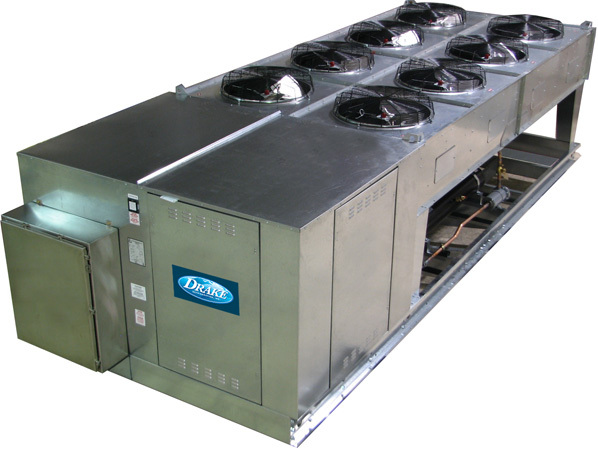 It is imperative that the chiller is able to meet the changing demand of your application. Digital scrolls, cylinder unloading, and hot gas bypass are just some of the capacity control options that we offer. 3) Oil Chiller: The industrial environment is harsh on machine tools, which makes keeping oil cool imperative. An overheating machine tool can lead to premature failure and long periods of downtime. Drake's oil chillers are specifically designed for industrial machine tools to increase efficiency, reliability and lifetime.